Yesterday afternoon I headed over to the Redondo Beach Pier and did some witnessing before class. 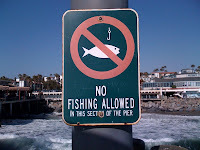 I was glad that the "No Fishing Allowed" sign only depicted "fish" and not "men". I was also glad that I was not fishing for "White Croaker" but for those who are in need of the saving grace of Jesus Christ. 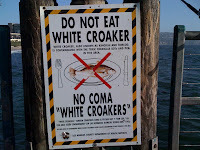 After all, it is appointed for man to "croak" once and after that the judgment. Last night marked probably the best and most encouraging one-to-one witnessing conversation I have had since I have been actively sharing my faith on the street over the last year. Most of the one-to-one conversations I have had lately have all been rather difficult conversations. I believe that God knew I needed some encouragement so he allowed me to have the following conversation. Notice how God has been working on this couple, drawing them to Himself. It is apparent that they have been pondering the things of God and what a blessing it was to have been a part of His dealings with them. Did they repent and put their trust in Jesus on the spot? No. But, I believe that some stony ground was tilled and seeds of the gospel were planted on some good soil. Also, notice (at time marker 4:45) that Falstina says, "Usually I would cut somebody off who approached me like this, and I'm really hungry, but I like talking to you so keep going, go ahead". This was "friendship evangelism" as I define it. This was a friendly conversation! Even though we were talking about a difficult subject (sin, law, death, judgment, heaven or hell), this was - and was perceived as - a friendly conversation. I can truly say that I love this couple. I do not want them to spend eternity in Hell. I want them to repent and put their trust in Jesus. I loved them enough to pray through my fear, get out of my comfort zone, and approach them despite the fact that they were complete strangers and I had no idea whether they would be friendly or not. I allowed my love for them to overshadow my fear. Glory to God!! Ok, this is getting kinda long so I'll just let you listen for yourself. I'd love to get some feedback and discussion going about this conversation, so please leave a comment. A very real conversation with some very real people, it sounds like. You've got a couple of proven things going for you here, Jeff: 1)an ability to break into strangers' spaces and begin a friendly conversation with them (a testimony to the 'ice breaking' effect gospel tracts can provide, yes?) and 2) the WAY you spoke to them, with gentleness and respect (1Peter 3:15), paved the way for them to be willing to speak to you despite the hot topic. They even said so. So, aside from idling helicopters you were standing beside, the conversation sounded good to me. Awesome witnessing encounter. You used tact and a spirit of gentleness. I will pray that they will come to the knowledge of the truth.